Delegates from 90 communist parties from 73 countries took part in the meet. The 20th International Meeting of Communist and Workers’ Parties (IMCWP) concluded in Athens on November 25. 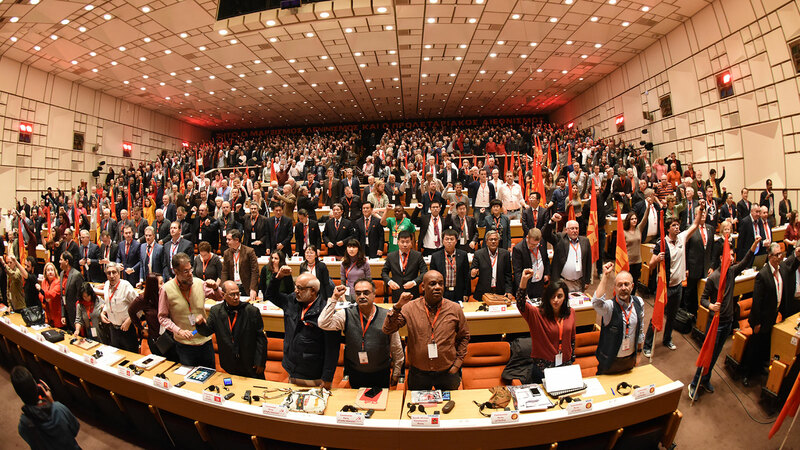 Delegates of 90 communist parties from 73 countries participated in the event that began on November 23 at the Central Committee headquarters of the Communist Party of the Greece (KKE). The meeting discussed the situation in various countries and the role of the communist parties in the struggle against exploitation and imperialist wars, the fight for the rights of workers and peoples, and the struggle for peace and socialism. The meeting was held on the occasion of 100th anniversary celebrations of the founding of the KKE. The participants reaffirmed their internationalist solidarity with the Syrian, Palestinian, and Cypriot people; with the masses of Lebanon, Sudan, socialist Cuba, Venezuela, Brazil, Iran and with all those who face imperialist attacks and threats. They condemned the attack on democratic rights and freedoms and expressed full support to the communists persecuted in Poland, Ukraine, Sudan, Kazakhstan and Pakistan, as well as to the communists facing legal and political processes in Russia and elsewhere. In their joint appeal, the communist and workers’ parties called for the development of common and convergent actions in the coming time along the following themes; (1) against imperialist war, interventions and militarization, (2) to defend the history of the communist movement and the values of proletarian internationalism, (3) to strengthen internationalist solidarity with the struggling peoples who face occupation, imperialist threats and interventions, (4) multi-faceted class solidarity with workers’ struggles for labor, social, trade union rights, against the offensive of capital, (5) for women’s rights and emancipation, (6) struggle for political and trade union freedoms and democratic rights against fascist forces, reactionary regimes, racism and xenophobia, religious fanaticism and social oppression, and (7) development of actions to protect the environment. One of the key aspects of the deliberations at the gathering was the outright rejection of the idea of eurocommunism. While addressing the gathering, Marco Rizzo, secretary of the Communist Party of Italy, denounced the revisionist line of eurocommunism. “The Italian labor movement has paid heavily for the lines of collaboration and compromise with the reformist parties. The internal and external participation of the bourgeois governments and the center-left coalitions has made them complicit in the approval of the worst anti-people measures, invisible to the masses and, finally deprived [them] of their content for years and, therefore, of parliamentary representation;” he said. Earlier, delivering the inaugural address, D. Koutsoumbas, the secretary of KKE, asserted that “The working class of the world will rise again to the challenge of its historic role”. Other delegates, during their deliberations, shared their concerns regarding the global rise of the right wing, modelled on the Donald Trump-led US administration. They also highlighted issues such as racism and the worsening of the refugee crisis. The annual event was launched in 1998 under the auspices of the KKE as an international platform where parties could gather to share their experiences. A meeting of the European Communist Initiative was also held on the conclusion of IMCWP on November 26 and 27. Hey Buddy!, I found this information for you: "Meet of communist parties calls for intensifying struggle against exploitation, imperialism". Here is the website link: https://peoplesdispatch.org/2018/12/01/meet-of-communist-parties-calls-for-intensifying-struggle-against-exploitation-imperialism/. Thank you.